Last Friday, when Hilary was visiting, we had some friends over for dinner and drinks. My friends said they wanted Mexican, so I spent some time deciding what to make. Usually when we have Mexican at home, it consists simply of taco fixings. But this time I wanted to do something a little more creative. One of my favorite things about living in Texas was the Mexican restaurants that abounded. There were two authentic Mexican places in our little town. One of them made sour cream chicken enchiladas that Jim and I just loved. (There was also a really good place in the Fort Worth Stockyards that had them too.) I thought it would be fun to create a version at home. I did a little online searching to see how people usually make them. I was surprised at how many recipes contained condensed soup of some kind, either cream of chicken or cream of mushroom. That didn't sound anything like what I was thinking of. Hilary and I went grocery shopping without a recipe for guidance. I knew that I wanted the filling to be creamy and cheesy, with chicken. We decided that since the inside would have a rich white sauce, we would use a traditional enchilada sauce on the outside. We chose Monterey Jack cheese for the filling. We used a bit of cream cheese along with the sour cream to thicken the filling so it didn't all run out of the open-ended enchiladas while they were baking. It was so fun creating a recipe with my sister. They wouldn't have turned out so good without her. She decided that we should name our new creation. She came up with the great name, Enchiladas Hermanas, "The Sisters' Enchiladas." Preheat oven to 375˚. Combine cream cheese, sour cream, and 2 cups of cheese in a saucepan. Heat on low heat until cheese is melted. Add chicken to cheese sauce. Spread a small amount of enchilada sauce on bottom of a 9 x 13 glass baking dish. Fill each tortilla with chicken filling and fold over. Place enchiladas folded side down in baking dish. Pour remaining enchilada sauce over tortillas. Cover dish with foil and bake for 30 minutes. Uncover, top with remaining cheese, and bake an additional 5 minutes or until cheese is melted. We didn't cover the dish with foil, and they turned out a little crispy on the edges that weren't covered with the enchilada sauce. Also, we were planning on grilling the chicken, but it was too cold, so I browned them in the skillet (with some chicken fajita seasoning) and baked them through in the oven. Thanks so much, Hil! I can't wait to create things in the kitchen with you again! Will try using part skim cheese and light cream cheese next time to reduce the fat and calories. So, I've been making a simplified version of this. Not sure it still qualifies as the same dish. I combine fat free sour cream, shredded cheese, finely diced onions, and the shredded chicken, but don't heat it up. 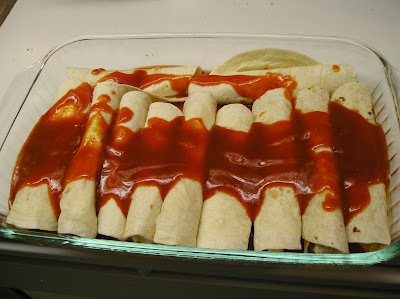 I spoon the filling into tortillas and cover with enchilada sauce. Then I bake it just like the other way. I like this better because the cheese turns out better when it melts in the oven than if you pre-melt it.